The article describes the origin, incidence and the locations of facial nerve schwannoma accurately. Facial schwannomas arise most often from the intratemporal course of the nerve with only 9% tumors located along the extratemporal course of facial nerve in the parotid gland. In the intratemporal area, most facial schwannomas arise from the geniculate ganglion, the labyrinthine segment of the facial nerve  and the internal auditory canal. Over 60% of the tumors involve two or more segments of the facial nerve. The commonly performed imaging protocol for the evaluation of facial nerve schwannomas includes high-resolution computed tomographic (HRCT) scan of the temporal bone with multiplanar reconstructions and pre- and postcontrast multiplanar magnetic resonance imaging (MRI) sequences centered on the internal auditory meatus (IAC; axial 2 mm T1-weighted imaging (WI), three-dimensional 0.6 mm heavily weighted T2-weighted imaging (constructive interference in steady state [CISS]), axial 2 mm T2-weighted fat-saturated imaging, coronal 2 mm postcontrast T1-weighted fat-saturated imaging, and postcontrast isovoxel (Volumetric Interpolated Breath-hold Examination [VIBE]). A simultaneous MRI of the brain (5 mm axial T2-weighted and 5 mm postcontrast T1-weighted sequences) is also routinely performed. The lesions appear as iso-to hypointense to brain parenchyma on T1 weighted images and hyperintense on heavily weighted T2 images. They generally show homogenous postcontrast enhancement although cystic degeneration may cause a heterogenous enhancement. The MRI findings combined with a widening of the Fallopian canal More Details seen on HRCT is almost pathognomic of a facial schwannoma. A facial nerve schwannoma arising from the segment of the facial nerve present in the cerebellopontine segment or the internal auditory canal cannot be differentiated from a vestibular schwannoma unless it extends to the labyrinthine segment of facial nerve. A characteristic enhancement of the labyrinthine segment on T2 weighted images (labyrinthine tail) may be seen in facial nerve tumors. However, a purely intracanalicular schwannoma causing facial weakness is most likely to denote a facial nerve schwannoma rather than a vestibular schwannoma. Facial schwannomas most commonly arise from the geniculate ganglion area or the labyrinthine segment of facial nerve. The schwannoma arising from the geniculate ganglion can expand superiorly and may abut the middle cranial fossa. A schwannoma along the labyrinthine segment of the facial nerve may expand towards the middle cranial fossa and/or the posterior cranial fossa, making it appear dumb-bell shaped, the labyrinthine part being the narrowest [Figure 1]a,[Figure 1]b,[Figure 1]c.
Facial schwannomas along the tympanic and mastoidal segment of the facial nerve are diagnosed by studying the MRI features together with the HRCT showing widening/erosion of the fallopian canal. These tumors additionally also present with early facial weakness which aids in the diagnosis of these lesions. As reported in the above published article, the single case of intratemporal schwannoma was missed because of lack of co-relation with HRCT. Facial schwannoma along the extratemporal facial nerve presents as a painless swelling over the parotid gland. Since it presents most often without facial weakness, it is most often clinically misinterpreted as a parotid adenoma. On MRI, there is no definitive radiological clue that may accurately differentiate a facial schwannoma from a parotid adenoma. In some cases, the tumor has a higher signal intensity around the periphery on T2WI (also known as the target sign) which is suggestive of a schwannoma. It may be prudent to look for a widening of the stylomastoid foramen on HRCT in these cases. If this sign is present, it suggests a facial schwannoma rather than a parotid adenoma. With facial nerve schwannomas, there are several reports of fine needle aspiration being non-diagnostic and a diagnosis of pleomorphic adenoma is given, which makes the surgeon less conscious of the possibility of a schwannoma. There are various reports in literature describing how a superficial parotidectomy was planned and that the facial nerve tumor was only diagnosed intraoperatively., Since resection of a facial schwannoma detected intraoperatively puts the facial function at risk, some authors suggest a biopsy of the lesion from a non-vital area in these cases. The biopsy itself may cause a weakness of the facial nerve but its function gradually recovers again. Definitive surgery for the facial schwannoma proceeds only after due informed consent from the subject is taken regarding the risk of compromise of facial nerve function in the postoperative period. Various algorithms have been proposed to treat facial nerve schwannomas by several authors including observation, decompression and surgery. Surgery has been described as stripping (nerve fascicle sparing), resection with end-to-end anastomosis or nerve grafting. In case the proximal segment of facial nerve is unavailable for repair, then facial–hypoglossal anastomosis has also been suggested. However, treatment has to be individualized and depends on various factors like location of the tumor, the size and progression of the tumor, the presenting symptoms and the preoperative facial nerve status. If facial weakness is Grade III or lower, a stripping surgery is attempted by a few surgeons. However, subtotal excision is associated with a short term improved facial function but a high chance of recurrence of the tumor a long-term basis. It is usually observed that the nerve fascicles are splayed over or are inseparable from the nerve and complete tumor removal by resection and nerve grafting is the preferred line of treatment. We personally do not attempt stripping surgery (except in certain facial nerve hemangiomas) and prefer resection with nerve grafting, where indicated, for facial schwannomas. Observation with serial MRI scans is recommended in subjects with small, asymptomatic tumors or in tumors associated with upto Grade II facial weakness (based upon the House-Brackmann [H-B] grading). In intratemporal facial nerve schwannomas that are associated with facial weakness of Grade III or worse (H-B grading), an early surgery is recommended. This is because progression of the schwannoma within the fallopian canal may destroy nerve fascicles further so that any delay in the conduction of surgery would lead to a poorer facial function. In the case of an intra-parotid facial schwannoma, opinion is divided on performance of an early surgery even when the patients remains aymptomatic versus tumor excision only when the facial weakness manifests. We recommend surgery only when the subject has facial weakness of Grade III or worse (H-B grading). Sampath Prasad et al., recommend an early surgical intervention regardless of the preoperative facial and hearing function in the following cases: extratemporal facial nerve tumors extending into the bifurcation in the parotid gland, multi-segment tumors extending into both the cerebellopontine angle and the middle cranial fossa, fast growing facial nerve tumors with worsening facial nerve function, and large facial nerve tumors with temporal lobe compression. Depending upon the location of the tumor, a variety of approaches are used either alone or in combination and include the translabyrinthine, middle cranial fossa, transmastoid and superficial parotidectomy approaches, with resection of the schwannoma, identification of tumor free cut ends of facial nerve, and nerve grafting. The segments of facial nerve harbouring the schwannoma need to be resected with a fairly safe margin [Figure 2]a. The resection margins of the facial nerve need to be cleanly cut. Greater auricular nerve and sural nerve are the two commonly used nerves for nerve-graft harvesting. The nerve graft is taken and all loose soft tissue over it is trimmed. The nerve graft needs to be longer than the defect so that it is not stretched between the two ends of the facial nerve. The polarity of the nerve graft is reversed i.e., the proximal end of nerve graft is sutured to the distal facial stump whilst the distal end of nerve graft is sutured to the proximal stump of the facial nerve. The reason for this is based on the physiology of degeneration and regeneration of the nerve. The external epineurium is peeled over the edges of the graft as well as the recipient facial stumps so that the perineurial ends can be sutured to each other [Figure 2]b. It is of utmost importance to ensure that the endoneurial surfaces of the two sides match and approximate well. Suturing is performed using 8-0 monofilament taking care to avoid damaging the nerve fascicles at either end. Usually two to three sutures are adequate to achieve a good approximation [Figure 2]c. At the cerebellopontine angle, the nerve-ends for coaptation are glued together using tissue glue. 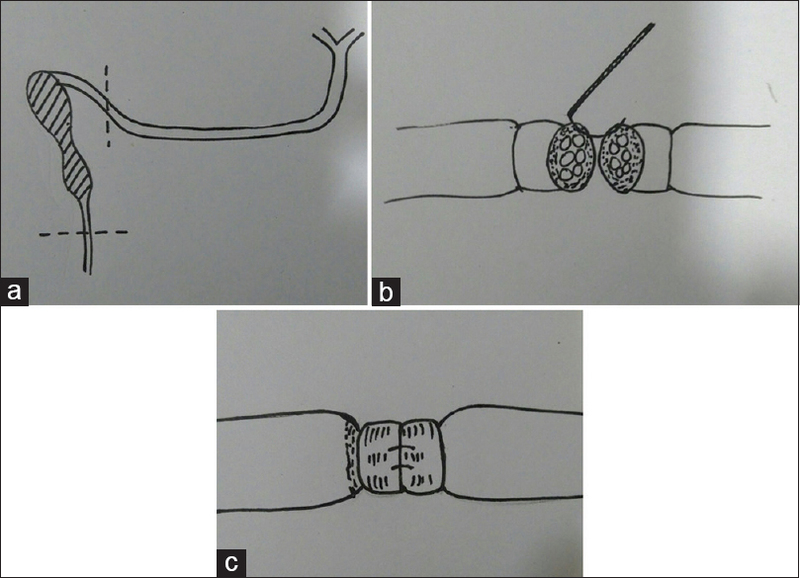 Nerve resection and anastomosis using nerve graft gives a Grade III (H-B grading) result at the best. It is also known that an extradural cooptation gives a far better outcome than an intracranial or transdural cooptation. Hence, the preoperative facial grading and timing of surgery are the two most critical factors determining the final outcome. We thank Dr. Panna Prayaga, Consultant ENT Surgeon, for the line diagrams included in this article. Sah SK, Guo YY, Mahaseth N, Chen Y, Du S, Li Y. Facial nerve schwannomas: A case series with an analysis of imaging findings. Neurol India 2018;66:139-43. Kertesz TR, Shelton C, Wiggins RH, Salzman KL, Glastonbury CM, Harnsberger R. Intratemporal facial nerve neuroma: Anatomical location and radiological features. Laryngoscope 2001;111:1250-6. Munanda O, Purohit BS, Kumar TS, Tan TY. Imaging of facial nerve schwannomas: Diagnostic pearls and potential pitfalls. Diagn Interv Radiol 2016;22:40-6. Fyrmpas G, Konstantinidis I, Hatzibougias D, Vital V, Constantinidis J. Intraparotid facial nerve schwannoma: Management options. Eur Arch Otorhinolaryngol 2008;265:699-703. Mehta RP, Deschler DG. Intraoperative diagnosis of facial nerve schwannoma at parotidectomy. Am J Otolaryngol 2008;29:126-9. Caughey RJ, May M, Schaitkin BM. Intraparotid facial nerve schwannoma: Diagnosis and management. Otolaryngol Head Neck Surg 2004;13:586-92. 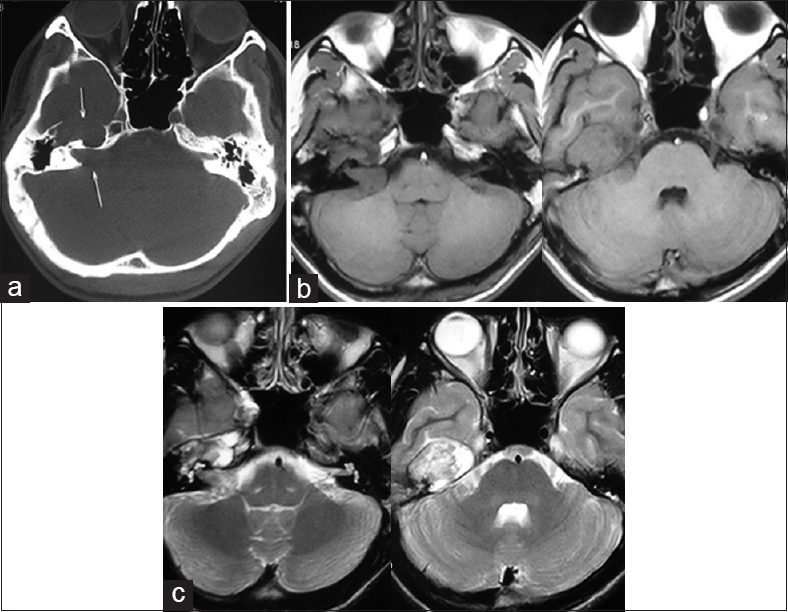 Li Y, Liu H, Cheng Y. Subtotal resection of facial nerve schwannoma is not safe in the long run. Acta Otolaryngol 2014;134:433-6. Falcioni M, Russo A, Taibah A, Sanna M. Facial nerve tumors. Otol Neurotol 2003;24:942-7. Prasad SC, Laus M, Dandinarasaiah M, Piccirillo E, Russo A, Taibah A, et al. Surgical management of intrinsic tumors of the facial nerve. Neurosurgery 2017 Sep 29. doi: 10.1093/neuros/nyx489. Prasad SC, Balasubramanian K, Piccirillo E, Taibah A, Russo A, He J, et al. Surgical technique and results of cable graft interpositioning of the facial nerve in lateral skull base surgeries: experience with 213 consecutive cases. J Neurosurg 2017 Apr 7:1-8. doi: 10.3171/2016.9.JNS16997.